The Idaho Transportation Department will begin reconstructing and widening the shoulders of I-84 between the Karcher and Franklin Boulevard interchanges on Wednesday, Sept. 26. This is the first step of widening I-84 through Nampa. All traffic lanes will remain open between 5 a.m. and 10 p.m. as crews will work primarily at night. Speeds will be reduced to 55 mph during the day and night. Traffic will be down to one lane in each direction during construction times. The work will continue until mid-November. 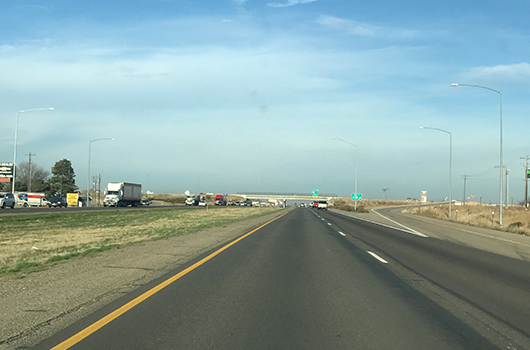 The newly reconstructed shoulders will be used to keep two lanes of traffic flowing in each direction when I-84 is widened to three lanes between Karcher Road and Franklin Boulevard starting next spring. In 2019 and 2020, ITD will replace the Karcher Overpass, redesign and reconstruct the Northside Interchange, and rebuild the bridges over the railroad and Mason Creek. Improvements are expected to improve safety, capacity and traffic flow in Canyon County for many years. A separate environmental study is underway to identify needed improvements between the city of Caldwell and the Karcher Interchange. For more information on the I-84 expansion project, please visit itdprojects.org/i-84-karcher-to-franklin or text 84CORRIDOR to 22828.